Childcare is easily one of the most daunting decisions that any working parent has to make. Keeping that in mind, it’s no surprise that maternity leave can often leave people with a sense of dread. The maternity leave isn’t the problem, it’s the massive laundry list of unknowns that come with transitioning back to work with a newborn in-tow following that leave. That is why we are proud to offer The Hatchery Maternity program! Transitioning back to work doesn’t have to be so daunting. With our program you don’t have to come back to your office full time immediately, you don’t have to do the guesswork of packing a diaper bag for 9+ hours, and you’re able to continue your breastfeeding journey without the pressure of scheduling pumping since your child will be right next door. Often times, this serves as the perfect transitional piece in a working parent’s journey. Consider it the training wheels version of coming back to work postpartum! It’s the first stepping stone back into the business world postpartum, and we feel honored that we get to help others in this small piece of their parental journey. 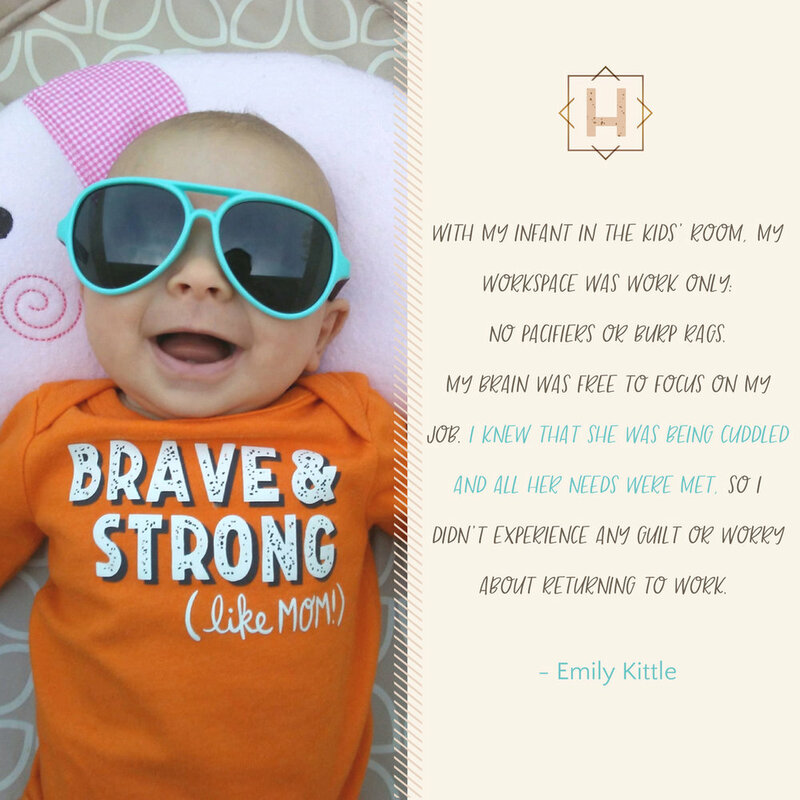 We are delighted to share this interview with you from our member Emily Kittle, the first of our Hatchery Maternity Program clients. Learn all about how transitioning back to work with The Hatchery worked for her. Emily Kittle is an Underwriter with Veterans United Home Loans. We had the pleasure of serving her and her newborn baby through The Hatchery's Maternity Program! What was your experience working at The Hatchery when using the Back To Work Program? My experience was very positive. I plan to utilize the Back to Work Program when I have my next child. I truly miss being at The Hatchery and the community they have there. The company I work for is wonderful, but there is an intangible quality in the air when you're surrounded by people who are their own boss and hustling for their livelihood. It inspired me to do more. How did the Back to Work Program assist you - mentally and physically? I'll start with physically because I think that's easier to put into words. This is my first child, and getting out the door with all items needed was a new part of the routine. It made it much easier to go directly to the Hatchery rather than having to drop the baby off at a child care provider first. Then once we got to the Hatchery, my little one went straight to the kids' area, and I got right to work. When she needed to nurse, I just stopped by the room, picked her up and we were able to go to the designated nursing room. Physically this was so convenient. If you've ever had to pump on a regular basis, you know that being able to breastfeed is preferred. It's efficient, with no cleanup, and you have that wonderful bonding time with your baby. Then you drop the kiddo back off, and get right back to work. It was great! Another aspect that I liked was if my child suddenly got sick, I could immediately pack up and head home with her. I wouldn't have to drive to daycare and then home. Mentally, The Hatchery made being a new working mom such a positive and manageable experience. With my infant in the kids' room, my workspace was work only: no pacifiers or burp rags. My brain was free to focus on my job. I knew that she was being cuddled and all her needs were met, so I didn't experience any guilt or worry about returning to work. Bonus, I got to be around adults! I had my child during flu season, so I spent a majority of my maternity leave shut in my house with few visitors to limit her exposure. Coming to the Hatchery, I was able to interact with a whole new crew of people with diverse projects and goals. And since there were other working parents in this relaxed yet professional environment, I could expect some grace if I walked in with spit up on my shirt. How did you pitch the program to your employer? I wrote a proposal to my employer that outlined what I would utilize to complete my job tasks, and why I wanted to do this at The Hatchery. I was elated to find out it was accepted. My plan was to work part-time from The Hatchery to ease back into full-time work for 2 weeks. My work includes handling customers’ sensitive information, so the secure Wi-Fi, and members-only access is a must to ensure security requirements are met. Did you feel the time you spent at The Hatchery was adequate to adjust back into a full time working role? I spent two weeks working from 8-12 at The Hatchery, and it was perfect. When I started back full time at my office, I was ready to work. There was no anxiety about how my daughter would do in the care of others, and I didn't have any regrets about needing more time at home. Would you recommend the Back to Work Program to others? I already recommend the Back to Work Program to others. Working half days for 2 weeks before I went back to true 9-5 full time helped me ease out of my napping habit, and into my working routine. It was motivating to work alongside other working parents and entrepreneurs who came in each day to make sh*t happen. It gave me the physical and mental space to transition back to work without the guilt or worry. For more details about our back to work program, please contact us at info@thehatchery.club - we would be happy to answer any questions for both employers and employees!